I love scones so, so much. By and large, they are easy. And delicious. And totally adaptable. You can make scones out of virtually any flavor with any add-ins you’d like. 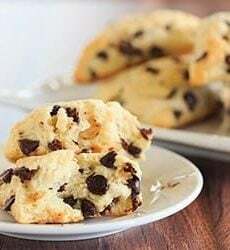 Dark chocolate chip scones are one of the very first baked goods that I made on my own, and would make all of the time. 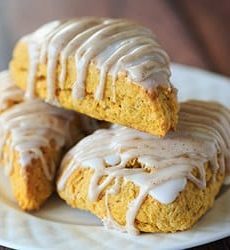 They became such a favorite with my family that even now, with all of the other desserts I have in my arsenal, when I ask my mom what kind of cake or dessert she wants for her birthday, she always asks for those scones. 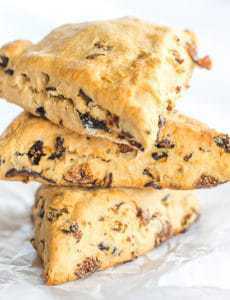 Almost a year ago I posted Blueberry Buttermilk Scones, and a reader responded with three of her favorite scone recipes. This was one of them, and I’ve had it in my head to make since I received the email, and am so sorry I waited so long. These will definitely become a staple in my kitchen, especially during the fall and winter months. 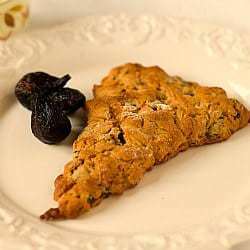 If you enjoy scones, oats and figs, you absolutely, positively cannot go wrong with this recipe. As with all scones, these are incredibly easy to throw together – you need only a couple of bowls, a whisk and spatula. It comes together very easily and you’ll have them mixed up and out of the oven in about 45 minutes. These have a fantastic texture thanks to the oats and a really mild flavor thanks to the honey. And if you’re a fig fan, as I am, you won’t be able to get enough of all those pockets of chopped figs. You can use fresh or dried, whichever is more readily available for you. A quick note – I forgot to check my oven thermometer on these and they got a little over-done without my realizing until I spotted the actual temp. Yours won’t brown that much, and won’t spread as much either. A good lesson on how important an oven thermometer is! 1. Preheat the oven to 350 degrees F. Line a baking sheet with parchment paper; set aside. 2. In a medium bowl, whisk together the flour, oats, baking powder, salt and cinnamon. 3. In a separate bowl, whisk the egg and canola oil together. Add the honey and mix until combined. Pour the liquid mixture into the dry ingredients and fold together with a rubber spatula to combine. Add the cream and mix together (the dough will be a little wet). Cover the diced figs with the sugar and gently fold into the dough. 4. On a well-floured surface, and dusting the top of the dough with more flour, pat the dough out into a 7-inch circle. Cut into 8 triangles. Place on the prepared baking sheet. 5. Bake for 20 to 25 minutes, or until lightly golden brown. Serve warm or at room temperature. Leftovers can be stored in an airtight container, but they are best the same day they are made. 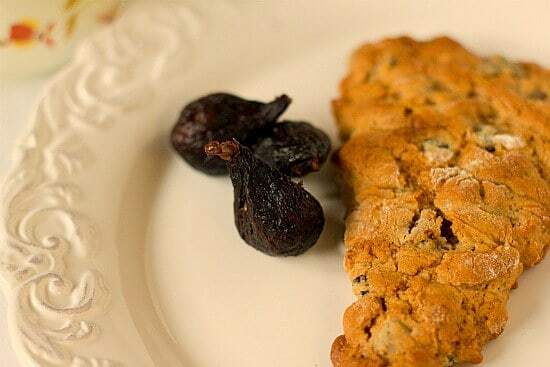 I love figs and scones, so this is a perfect combo for me. When I tried making this, though, it was so wet, I could not transfer it to the sheet. Is that normal? When you say well-floured, how much flour about? It also took longer to bake. Hi Crystal, Pretty much as much flour as you need to be able to handle it. I have found with almost every scone recipe I’ve baked that you need to be pretty heavy-handed with the flour when you turn the dough out. I love scones! I’d make one each time i take tea but unfortunatly i’m on a diet! So i can’t make them that often! And yours are really good, i loove figs! Your scones are made for me! I love, love the Jewel Tea Autumn Leaf pattern dish in the background! My mom had that set…she sold most of it in a garage sale when I was little and she’s missed it ever since. 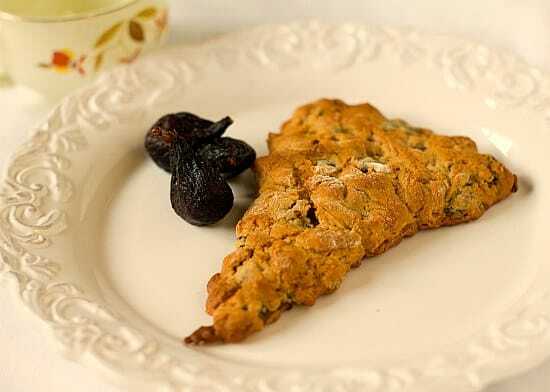 The scone looks lovely ! Lori, Those dishes were actually give to my mom from my great Aunt. She has since passed away, and everyone always reminisces about her when they see those dishes! Ooooo these look perfect for breakfast!